ShukerNature: MY TWO-HEADED KESTREL – ALL IS REVEALED! 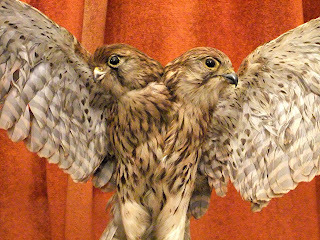 When I encountered the above taxiderm specimen of a European kestrel Falco tinnunculus with two heads while browsing in a local market on 28 September 2012 (click here to read my ShukerNature blog post concerning it), I was very surprised to SEE it, but not at all surprised BY it. And if that in itself sounds surprising – and possibly even a little confusing! – please allow me to explain, via the following sequel, which in reality is a prequel. Freak shows and travelling circuses usually display at least one two-headed lamb or pig amidst their panorama of curiosities and caprices, so such entities are far from uncommon. The same can certainly not be said, however, for the erstwhile prize exhibit of a private natural history collection amassed some years ago by a friend of mine whom I shall refer to as Nigel F, from the West Midlands. 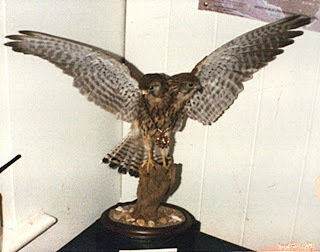 Among his array of fossils and stuffed animals was a winged wonder unlike no other – dating from Victorian times, it was a perfectly preserved taxiderm kestrel, with two heads. Silent testimony to the art of the expert taxidermist, it astonished and entranced all who viewed it, until eventually, along with most of his other specimens, Nigel sold it several years ago. Only then did he confess the truth to me – it was a fraud, albeit a truly amazing one. The left head was from another specimen entirely, which the taxidermist had meticulously attached to an already-prepared stuffed kestrel from Victorian times, to create this twin-headed falcon. 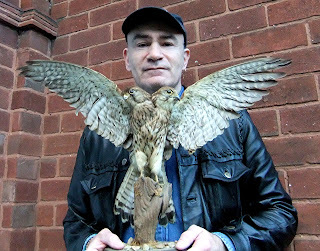 So superb was the artifice, however, as seen in this photograph which he had snapped of his dicephalous marvel some time before selling it (and which, amusingly, depicts the kestrel wearing a gold medallion and chain around its necks! 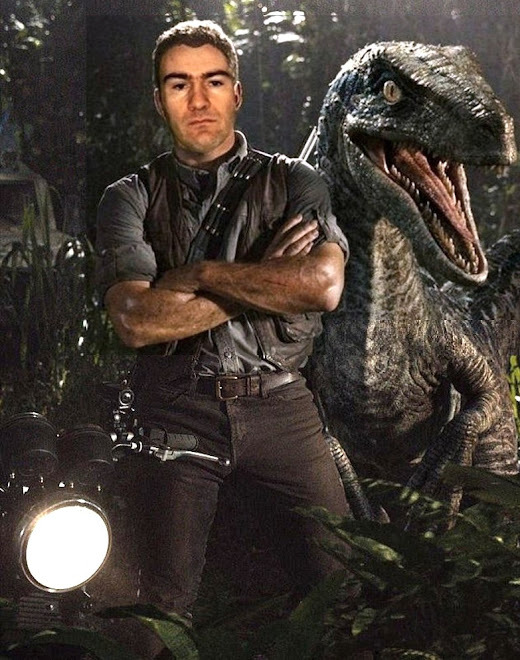 ), that even though Nigel knew which head was fake, he had great difficulty in detecting the zone of attachment, artfully concealed beneath its neck feathers. Indeed, to quote the famous words spoken by British television comedian Eric Morecambe concerning his comedy partner Ernie Wise’s alleged wig: “You can’t see the join!”. After Nigel sold his two-headed kestrel, however, the whereabouts of this wonderful specimen were no longer known, and there seemed little hope of ever tracing it again. Until 28 September 2012, that is, when I was extremely shocked, but delighted, to discover it for sale on a stall in the very same town where Nigel had sold it all those years previously! 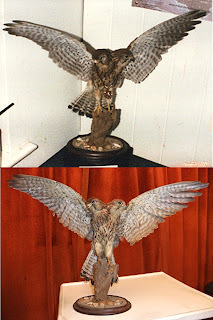 In any case, I recognised it instantly from Nigel's photograph (a copy of which he had given to me some time ago) – its pose, tree branch mount, and base were all identical, as can be readily confirmed here by comparing Nigel's photo of it with one of mine, snapped on 28 September. 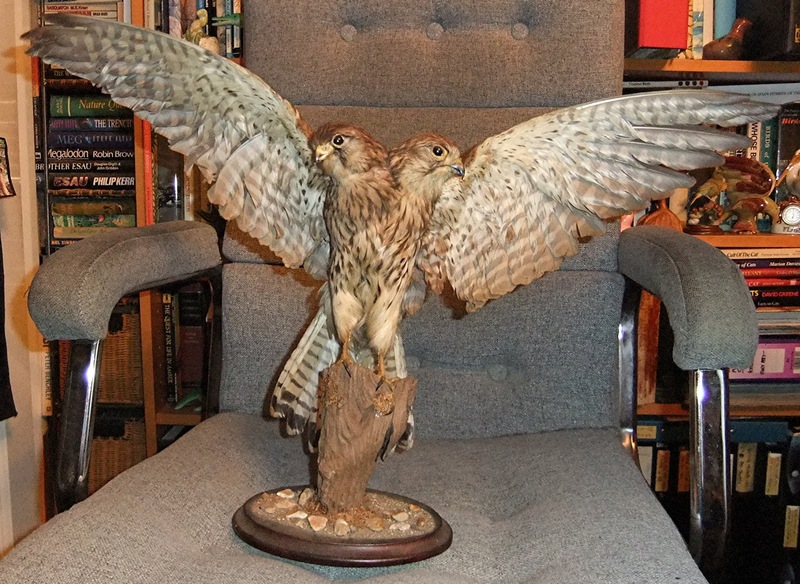 Clearly, therefore, the kestrel had been sold either directly to the stall holder by whoever had owned it after having purchased it from Nigel, or via one or more intermediary purchasers/owners if such existed. Whatever the explanation, I certainly had no intention of allowing such an astonishing (un)natural history exhibit to disappear into obscurity again – as would almost certainly have happened if someone else had purchased it. So I duly bought it myself. 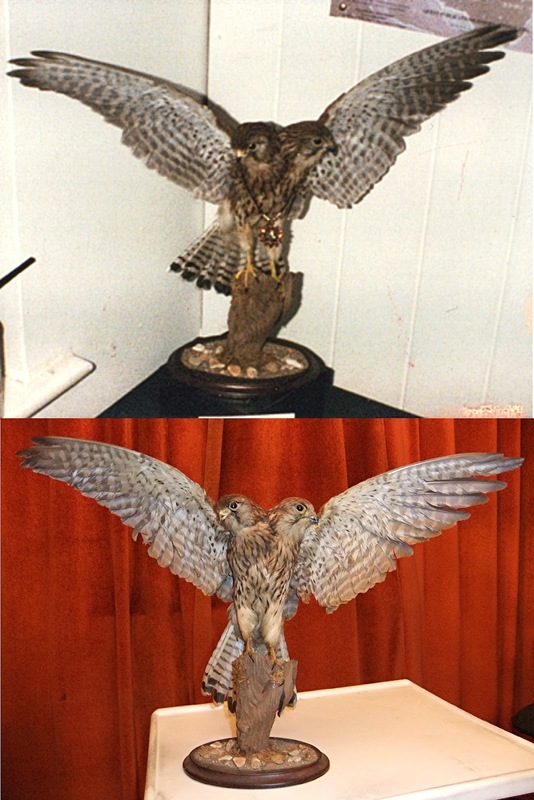 And once I inform him of its current whereabouts, Nigel will be happy knowing not only that his unique kestrel has resurfaced after all this time but also that it has found a good home again! Result! !